Antonov An-225 Completed Longest Consecutive Flights. Antonov Airlines has successfully completed the twelfth place in the longest succession of AN-225 flights in the commercial operational history of the aircraft. The Ukrainian airline delivered twelve Heat Recovery Steam Generator (HRSG) modules, each weighing 160 tonnes, for Hansa Meyer Global Transport GmbH & Co. on twelve consecutive flights from Chile to Bolivia. "The initial configuration of the cargo did not allow its loading on the aircraft and, as a result, the lifting points went back to work," said Andriy Blagovisniy, Commercial Director of Antonov Airlines. "The amended design, which had screwed joints, allowed us to eliminate the lifting points of the loads when they were installed on the loading ramp, which in turn reduced the height of the loads. "When we arrived at the destination, we took the cargoes to the loading ramp, and the specialists in the place reinstalled the lifting points in their initial positions, tying them with bolts for their subsequent lifting and unloading using external cranes. "A special low profile loading system designed by Antonov Company specialists was used to handle the high load height." 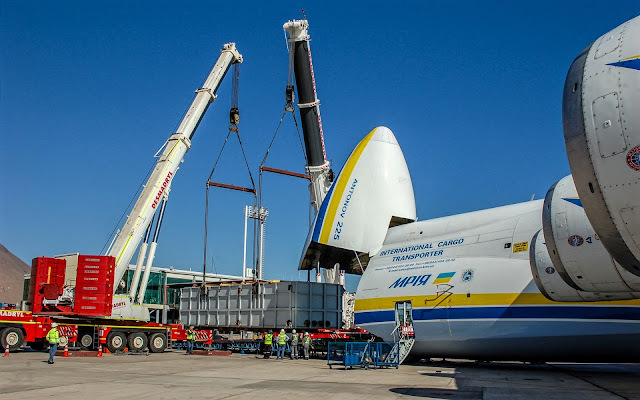 The weight distribution of the cargo of a piece on the aircraft floor initially exceeded the maximum values ​​allowed for the AN-225, the largest aircraft in the world. "Special damping panels and reverse curvature technology were introduced to address the weight distribution of the cargo," Blagovisniy added. "Our flight crew received special training that took into account the design characteristics of the cargo, to comply with the maximum G forces allowed during takeoff, flight and landing." Antonov Airlines secured the cargo inside the aircraft with a special mooring pattern, developed specifically for the project that allowed the welding of a calculated number of mooring points and special winch points for the cables of the winches of the aircraft. "As the Chimore airport has no provisions for night operations and flights, the entire process, including unloading the cargo and leaving the plane, had to be completed strictly during the day," Blagovisniy said. In Chimore, Bolivia, additional equipment was delivered for aircraft service and cargo unloading, including a ground power unit and a forklift. Antonov Airlines transported its own tow tractor from the Gostomel airport in Kiev, Ukraine to Chile to ensure proper towing of the planes on all twelve flights, as there was no tractor with the required power available at the Iquique airport. "This project saw the highest level of experience and coordination among the staff of all the partners involved in the AN-225 operation and the unloading of the aircraft, which allows the flights to fit our tight schedules," said Blagovisniy. .
"All the parties involved in this multinational project have acquired invaluable experience in providing logistic solutions using the AN-225, laying the foundations for fruitful cooperation in the future." Antonov Airlines operates a fleet of seven AN-124-100 aircraft, with a payload of up to 150 tons, a payload of 60 tons AN-22, the largest turboprop-propelled aircraft in the world, and its only AN-225 cargo of 250 tons, the largest aircraft in the world, as well as smaller aircraft AN-74 and AN-26.